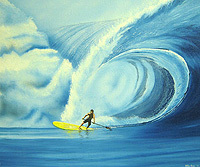 Artist and waterman Hilton Alves has long been a lover of the sea and water sports. Born in 1980 and raised in Guaruja, in Sao Paulo Brazil, Hilton began painting professionally in 2000. 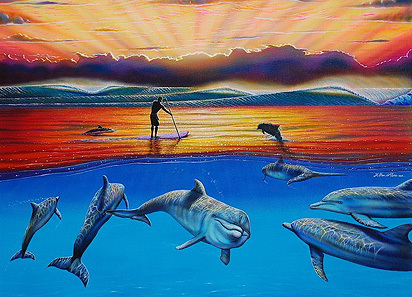 His passion leads him to express the magnificent beauty of the aquatic world in drawings, paintings and murals. Hilton has a passion for the sheer beauty of ocean life. 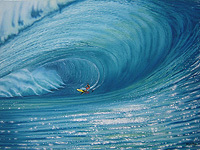 This beauty is expressed through a series of paintings about surf, marine life, perfect waves, seascapes, and others. 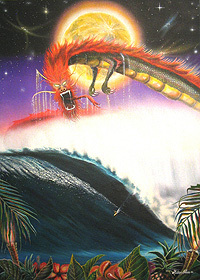 The self-taught artist uses oil, acrylic, and airbrush to bring life to his playful imagination and inspiring dreams. The artist brought his art to another level in 2004 when he began painting murals. 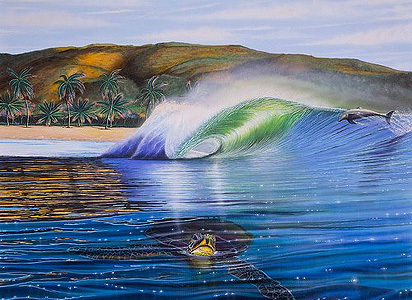 His murals convey the awe of the ocean and bring viewers closer to the earth's precious marine life and perfect waves. 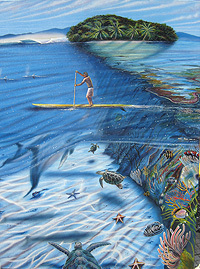 Hilton's murals can be admired in Santos, Guaruja, Sao Paulo, Bahia and Floripa in Brazil and on Oahu in Hawai'i. Created in 2004, Surf Art Kids is a social project designed to expose children and youth to environmental awareness and foster in them a respect and love for the ocean through art. 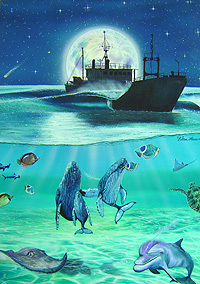 The initiative aims to bring marine art into the lives of the youth through social activities. These activities include, but are not limited to, live art exhibitions, community art projects, teaching painting techniques, teaching air brush techniques, drawing techniques, murals in schools, painting in hospitals and in organisations for special needs children and interactive community displays. "The project was developed because I wanted to broaden my horizons as a marine artist. This could spread my gift and put a little art and fun in the life of others" - reports Hilton Alves. Hilton lets the love of sports, such as surf, stand up paddle surf, body surf, body boarding, swimming, diving, and cycling be an inspirational source for guiding paint onto the canvas. As a testament to his personal drive and inspirational nature, the artist finds joy in participating in a variety of competitions. This growing artist is living proof that one never knows where inspiration will strike. As a surfer I am in the ocean every day, seeing perfect waves, movement, light, sunsets and marine life. In 2000, when I painted my first oil on canvas, I decided to continue painting as a way to follow my dreams. My art has taken me to many places that I would never see otherwise. It has shown me new worlds and I have met many interesting people because of it. Now I would like to show people my dreams about the ocean and what I envision in the liquid world.